The Confessions of Catherine de Medici went on sale yesterday - a rainy day here in SF. On sale days are odd amalgams of excitement, apprehension, and relief. The book is now officially out of my hands, no more fussing over a missed verb or awkward phrase; now, it belongs to readers and I must start the process of supporting it promotionally even as I must let go of my creative protectiveness. Having been through this before, I thought I'd be okay but I woke up early yesterday, overcome by the urge to check my amazon rank obsessively while simultaneously rushing out to every bookstore within a 100-mile radius to see the book. Fortunately, I had other duties as assigned, including a radio interview with the divine Liz St John at Radio Alice 93.7 AM. Liz's passionate support of authors is greatly appreciated; she is a devoted reader and her insightful questions helped me re-focus on my energies on more productive concerns. 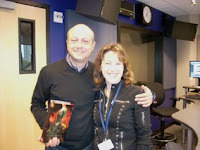 (See pic of me with Liz at the studio; the camera flash went on, unfortunately!). 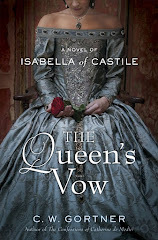 I also have had online activities, including a review and interview at Margaret Donsbach's HistoricalNovelsInfo, a guest post at Historical Tapestry, a guest post at fellow author Christy English's blog, an interview at my good friend Sarah Johnson's Reading The Past, and a review at Devourer of Books. As always, bloggers have been so enthusiastic; in this era of ever-dwindling marketing dollars, I owe them a huge debt of gratitude. On June 1, I'll start my official virtual tour, during which I'll visit 35 blogs; I'll post the schedule here for those who'd like to join me. I'm looking forward to it; tour organizer Cheryl Malandrinos of PumpUpYourBook Promotion has done a terrific job of bringing together a diverse selection. Off to a good start, I think. More later, and thanks as always to you, my readers, for all your support. 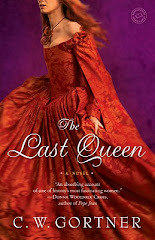 I truly hope you will enjoy Catherine de Medici's story. 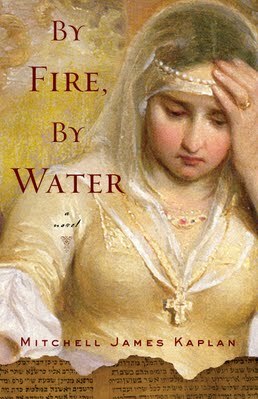 I am honored to present the following guest post by Mitchell James Kaplan, author of the forthcoming novel BY FIRE, BY WATER. Set in 15th century Spain during the reign of Isabella and Ferdinand, this beautifully written tale is about the ordinary men and women swept up in the chaos and upheaval of the Inquisition and the 1492 Expulsion of the Jews. Publisher's Weekly has praised the novel as "a naturally cinematic narrative" and Patricia Sullivan for The Historical Novels Review calls it "an engrossing read... [with] real men and women rather than historical caricatures." This can be very difficult subject matter for a novelist, both because of its complex historical context as for its tendency to incite a modern-day viewpoint of events that happened over 500 years ago. Mr Kaplan, however, has created a vividly rendered and sensitive account of this intense time as seen through the eyes of Aragon's converso chancellor, Luis de Santangel, who helped convince Queen Isabella to finance Columbus, and Judith Midgal, aunt of Columbus's official translator. His portrayal of this remarkable man and woman and their struggles to reconcile their past with their future amidst a rising storm of persecution humanizes his tale; and his evocation of a troubled Spain at the crossroads of its own past and future is equally well drawn. Please join me in welcoming Mr Kaplan, who has offered us this post about the circumstances leading up to his decision to write By Fire, By Water. I was living in Paris, in the chambre de bonne (maid’s room) of Monsieur M, a French political figure, and his wife, an attorney. I had very little money, so in lieu of rent I conversed over breakfast with Monsieur and Madame’s three children. My job was simply to keep their English fluent. A maid, a cook, and a chauffeur attended to their other needs. After breakfast, I lay on my bed and immersed myself in the literary worlds of Balzac, Baudelaire, Proust, Julien Gracq, Albert Cohen, and other French writers. I yearned to become a novelist, myself. I wanted to write a book that would grab readers and not let them go, a book that would say something important about the human condition. The problem was, I had no subject. So I kept reading. Reading was a form of prayer. Sometimes, in the afternoon, I crossed the Pont Royal to the Bibliotheque Nationale. Housed in the seventeenth-century palace of Cardinal Richelieu, of Three Musketeers lore, the French National Library allowed visitors to circulate in its outer salons, where a manuscript by Gustave Flaubert sat in a long glass case. I marveled at the great author’s perfectly balanced, sweeping penmanship, the handwriting of an extreme perfectionist. The movie producer, D, took his English lessons over dinner, offering plenty of wine with the boeuf bourgignon or coq au vin. My liver, utterly untrained in these matters, had no idea what to do with so much alcohol. I stumbled home through the small streets of Paris, wondering where life was leading me. It didn’t take long for D to learn that I was an aspiring writer. He introduced me to a book editor who worked for the publisher Robert Laffont. Two days later, I received a letter on the publisher’s stationery, addressed to the management of the Bibliothèque Nationale. Armed with this letter, I once again presented myself to the librarian, who placed a card in his typewriter and asked for proof of my identity. I’ll never forget the pride I felt. Only “real” writers and editors had the right to this little rectangle of cardboard. From then on, I spent my afternoons reading there instead of in my little chambre de bonne. It was in the Bibliothèque Nationale that I came across a curious little book that contained a list of the sailors who accompanied Christopher Columbus on his voyage of discovery in 1492. Most were men and boys from southern Spain; others hailed from Galicia, the Basque country, Portugal, Venice, Genoa, and Calabria. All possessed skills deemed necessary for a long voyage aboard a fifteenth-century sailing vessel – except one. Luis de Torres was Columbus’s “interpreter.” He spoke Hebrew, Aramaic, Arabic, and Spanish. I wondered: Why did Columbus need a translator who spoke Hebrew, Aramaic, and Arabic? Where, exactly, did Columbus think he was going? What did “the Indias” really mean, to Columbus? The question stayed with me. It nagged me. I began reading books about Spain at the end of the middle ages. Little by little, the pieces of a jigsaw puzzle appeared in my mind, but try as I might, I could not discern how they fit together. I knew that when they did, they would form my first novel. What I did not know was that years would pass before I would be able to write that novel, that life would intervene in unpredictable ways between the conception and the delivery. Thank you, Mitchell. All the best of success with your novel! To learn more about Mitchell James Kaplan and his work, please visit him at his website. 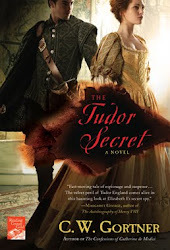 In midst of the exciting Historical Fiction Bloggers Roundtable Event, I got some good news: My UK editor at Hodder & Stoughton has acquired my work-in-progress The Princess Isabella, and the first three novels in The Elizabeth I Spymaster Chronicles, starting with The Tudor Secret, which will be published by St Martin's Press in the US. I owe my agent really expensive shoes! She's one of the hardest working women in the business and she champions me shamelessly. The Roundtable event is now officially over and I want to again thank the fantastic bloggers who invited me and gave me their all. Their creative posts, reviews, and other material really made this event fun and I'm very fortunate indeed to have been a part of it. To see the event in its entirety and visit the different blogs and posts, please click here. Last but not least, the marvelous Sharon Kay Penman, one of my all-time favorite authors, has interviewed me over at her blog. Please stop by. 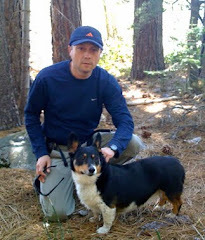 Besides my interview, Sharon has a very active blog with many comments and interesting posts about her books, research, love for animals, and other diverse interests. She's a great lady, and a great friend. Only 7 days till The Confessions of Catherine de Medici arrives in stores! I'm like a hen on an egg . . .
As promised, the Historical Fiction Bloggers Roundtable Special Pre-Launch Event for The Confessions of Catherine de Medici has begun. These hard-working and extremely creative ladies have designed a marvelous programme of events, the first of which are already up. To get a complete list of the events, please visit the HFBRT calendar here. I hope to see you as I tour these great blogs! 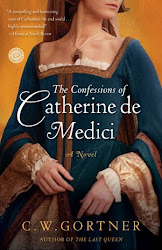 I'm very honored that the Historical Novel Society's Historical Novels Review has selected The Confessions of Catherine de Medici as an Editor's Choice for their May 2010 edition. The HNS has been such an instrumental organization for me, both professionally and personally, and I have to admit, this is my favorite review so far. I am re-producing it here, with HNS permission. Catherine de Medici came to the French court as a reluctant princess: young and naive, and yet somehow she knew her destiny was to guide France to glory. She was the last legitimate descendant of Lorenzo de Medici; she carried her pride well. It is written that she had second sight, and with this gift and her consultations with Nostradamus, Catherine was guided to act. After her husband’s death, her mediocrity faded and she gained increasing power. She emerged as an astute, formidable, and shrewdly confident regent who maintained a tenacious hold on governing France during her time. Religious tolerance was her mantra, and the survival of France was paramount. To know Catherine, the reader must understand her culture, social life, and children. Romance eluded her, with the exception of her often-overlooked friendship with Coligny, the Protestant leader whom she would later hunt down. The chasm between the followers of Calvin, the Huguenot heretics, and the Catholics who were the dominant power is historically important to her life’s story. Gortner interweaves this pivotal, complex issue into his novel, bringing with it clear understanding. 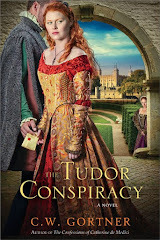 To start us off on a high note, please join me on the Historical Fiction Bloggers Roundtable Event, starting on May 8. If you happened to miss the banner hanging over my masthead with my pensive writer's mug or the one of the side of the blog with the pretty pearl bauble (both graphics courtesy of the multi-talented Lizzy Johnson of Historically Obsessed) then check it out and stop by if you can. I'll try to keep you up to date on where I'll be during the event, too, via this blog. The event will feature interviews, guest posts, reviews and a special giveaway at the end from yours truly: this is a special pre-launch party organized by the terrific, hard-working ladies of the Roundtable, who go all out to support writers and deserve a very warm round of recognition for balancing kids, jobs, boyfriends and fashion emergencies in order to blog for the rest of us. Thank you, my fair maidens of the Roundtable! I'm in awe of all of you. 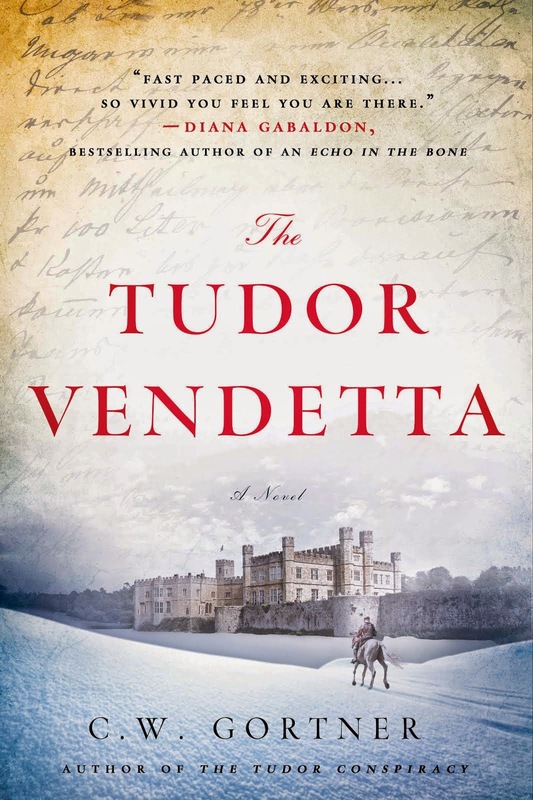 Gortner has reimagined the life of one of the most controversial women in history in a fresh, well-researched and powerful portrait of a queen and mother in the turbulent 1500s. With great sensitivity, he gives readers a woman struggling to keep her children and country safe. Readers will come away with new ideas, and that's just what historical fiction is supposed to do - open our eyes to new possibilities. - Kathe Robin. 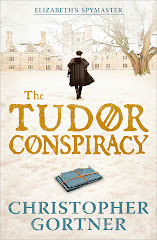 Other reviews are in from Booklist and the Historical Novel Society but currently embargoed until publication. As soon as I can, I will post them.